Karnataka: private colleges have asked the state government by submitting its petition on increasing the fees for undergraduate professional courses – medicine, and dental by 10 to 15%. It has been reported that two rounds of meetings on the issue has already taken place between the government and the management of the colleges. Currently the candidates appearing for the CET have to pay a fee of Rs 62,500 for MBBS courses and Rs 42,500 for dental courses. The fees for ComedK candidates doing medical is Rs 4.25 lakh and dental courses is around Rs 2.75 lakh. Any increase in the fee implied an increase of 10% for students appearing for CET and ComedK candidates by 15%. An agreement reaching a consensus between the higher education department and the management of private colleges is expected to be signed soon. As reported by TOI, this means the Karnataka Professional Educational Institutions (Regulations of Admission and Determination of Fee) Act, 2006 may not be implemented this year also. The state government had been planning to implement this to have a common entrance test for professional courses. 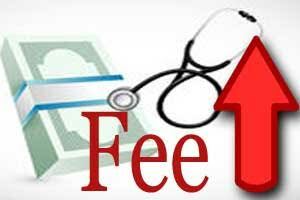 However there is no clarity whether the fees in government medical, dental and engineering colleges will be increased.